Every child’s needs must be considered individually to determine the frequency and intensity of services to provide a free and appropriate education. That said, how do you decide if a child receives 30 minutes of DHH teacher time 3 times a week or if it is appropriate to provide monthly consultation? It is all too easy for budgetary restrictions to determine service provision unless you have a means to systematically consider the relevant factors and make a logic-based decision about the appropriate amount of service. The leadership and DHH staff at the Special Education District of Lake County, just outside of Chicago IL, worked for an extended time to craft a rubric to assist them in determining appropriate levels of DHH service. As you will see, many varying factors are considered within the 3-page Hearing Itinerant Services Rubric. 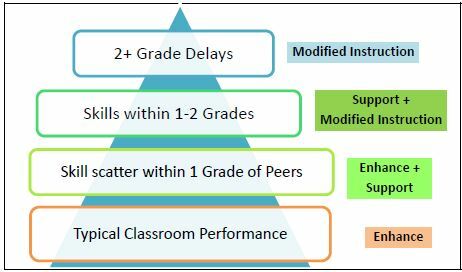 Of course, individual child issues or circumstances need to be carefully considered as well as the rubric recommendations, but use of this Service Rubric may provide the evidence basis needed for justification of appropriate levels of service to meet student needs – academic, class participation and expanded core skill development. Thanks much to the leadership of Lori Degman and the DHH staff at SEDOL for sharing this resource! Another matrix for service determination has been made available from the Michigan Department of Education – Low Incidence Outreach. Go here to view Educational Impact for Student who are Deaf or Hard of Hearing and for more background on this resource. Thanks to the Michigan Department of Education Low Incidence Outreach for creating this valuable resource! Service Delivery Guide for Educating Students Who are Deaf and Low Functioning was developed by Region 4, Houston Texas in 2016. As the title indicates, this matrix is different from the others as it is specific to students who are Deaf-plus. Matrix of Services was developed by the Florida Department of Education Bureau of Exceptional Education and Student Services in 2017 as guidance to indicate the intensity of support required to meet the needs of students identified as exceptional. It is not DHH specific. Be sure to download the large Matrix of Services Handbook that provides detailed explanations of all domains for appropriate use. Note: this large file may take extra time to access. Specially Designed Instruction for Students with Auditory Impairments is a 1-page summary of the areas of specially designed instruction that should be considered for students with hearing loss. The page lists the areas of Language, Communication, Cognition, Literacy, Academic Concepts, and Social-Emotional. For each area the impact on content/skills, teaching methodology, and delivery are listed. Thanks to the folks in Region 4, Houston Texas for their creativity in developing this resource. 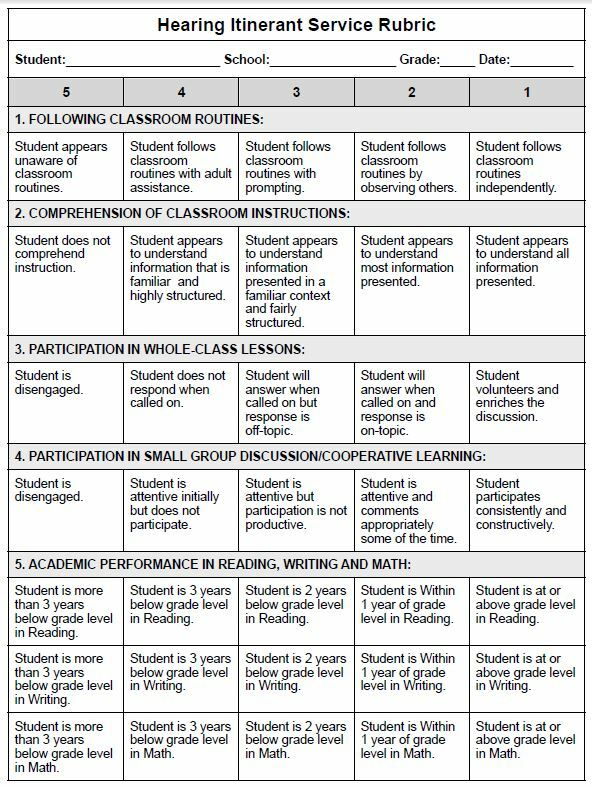 Iowa Expanded Core Curriculum Skills also has an extensive bulleted list of expectations of 4 levels of skill development. The information below has been derived from sections of the law, Office of Special Education Program comments and discussion provided at the U.S. Department of Education’s Individuals with Disabilities Education Act (IDEA). The guidance provided in this website helps clarify the intent of IDEA and may be useful to professionals and parents alike who are trying to advocate appropriate services and supports for children with hearing loss. Another valuable and brief summary is at U.S. Department of Education – Deaf Students Education Services. 1. There is a student with a hearing aid and a cochlear implant in his neighborhood school who is struggling. He receives services from the building SLP and is occasionally seen by the educational audiologist but there are no itinerant services provided by a teacher of the deaf/hard of hearing. I know other places have these services available but my district maintains that if a student has the needs of a teacher of the deaf/hard of hearing then they need to go to the center-based program. Most of these students use total communication. The Secretary recognizes that regular educational settings are appropriate and adaptable to meet the unique needs of particular children who are deaf. For others, a center or special school may be the least restrictive environment in which the child’s unique needs can be met. A full range of alternative placements as described at 34 CFR 300.551(a) and (b)(1) of the IDEA regulations must be available to the extent necessary to implement each child’s IEP. There are cases when the nature of the disability and the individual child’s needs dictate a specialized setting that provides structured curriculum or special methods of teaching. Just as placement in the regular educational setting is required when it is appropriate for the unique needs of a child who is deaf, so is removal from the regular educational setting required when the child’s needs cannot be met in that setting with the use of supplementary aids and services. Sec. 300.115 Continuum of alternative placements. (a) Each public agency must ensure that a continuum of alternative placements is available to meet the needs of children with disabilities for special education and related services. (b) The continuum required in paragraph (a) of this section must– (1) Include the alternative placements listed in the definition of special education under Sec. 300.38 (instruction in regular classes, special classes, special schools, home instruction, and instruction in hospitals and institutions); and (2) Make provision for supplementary services (such as resource room or itinerant instruction) to be provided in conjunction with regular class placement. The obligation to fully inform parents includes informing the parents that the public agency is required to have a full continiuum of placement options available to meet the needs of children with disabilities, including instruction in regular classes, special classes, special schools, home instruction, and instruction in hospitals and institutions. Sec. 300.115(a)Each public agency must ensure that a continuum of alternative placements is available to meet the needs of children with disabilities for special education and related services. 2. Due to a shortage of teachers of the deaf/hard of hearing to provide itinerant services, our district is imposing the use of a consultative model with most direct service being provided by the SLD teacher and/or SLP. Related services providers who do not meet the personnel qualifications established by the SEA would not be considered qualified to serve children with disabilities under the Act even with supervision by qualified personnel. Section 300.156(d), consistent with section 612(a)(14)(D) of the Act, clarifies that each State must ensure that LEAs take measurable steps to recruit, hire, train, and retain highly qualified special education personnel to provide special education and related services to children with disabilities under the Act. The definition of consultation services and whether a special education teacher provides consultation services are matters best left to the discretion of each State. While States may develop criteria to distinguish consultation versus instructional services, the Act and the ESEA are clear that teachers who provide direct instruction in a core academic subject, including special education teachers, must meet the highly qualified teacher requirements, which include demonstrated competency in each of the core academic subjects the teacher teaches. Special education teachers who do not directly instruct children in any core academic subject or who provide only consultation to highly qualified teachers of core academic subjects do not need to demonstrate subject-matter competency in those subjects. These special educators could provide consultation services to other teachers, such as adapting curricula, using behavioral supports and interventions, or selecting appropriate accommodations for children with disabilities. They could also assist children with study skills or organizational skills and reinforce instruction that the child has already received from a highly qualified teacher in that core academic subject. 3. Because I only provide periodic consultation, the district says it is unnecessary for me to attend the IEP meetings of my students with hearing loss (as in I should not attend). Section 300.321(a)(3) requires the IEP Team to include not less than one special education teacher or where appropriate, not less than one special education provider of the child. As explained earlier, a special education provider is a person who is, or will be, responsible for implementing the IEP. Therefore, if a speech pathologist, occupational therapist, or other special education provider, other than the child’s special education teacher is on the IEP Team, written consent from the parent would be required for the speech pathologist, occupational therapist, or other special education provider to be excused from attending an IEP Team meeting, in whole or in part, when the IEP Team meeting involves a modification to, or discussion of, the IEP Team member’s related service or area of the curriculum. … When an IEP Team member’s area is not being modified or discussed, Sec. 300.321(e)(1), consistent with section 614(d)(1)(C) of the Act, provides that the member may be excused from the meeting if the parent and LEA agree in writing that the member’s attendance is not necessary. An LEA may not routinely or unilaterally excuse IEP Team members from attending IEP Team meetings as parent agreement or consent is required in each instance. We encourage LEAs to carefully consider, based on the individual needs of the child and the issues that need to be addressed at the IEP Team meeting whether it makes sense to offer to hold the IEP Team meeting without a particular IEP Team member in attendance or whether it would be better to reschedule the meeting so that person could attend and participate in the discussion. 4. There is a teacher who is not providing accommodations to meet the needs of a student with hearing loss. 5. The school district no longer provides Extended School Year (ESY) services to students, including those with hearing loss. The requirement to provide ESY services to children with disabilities who require such services in order to receive FAPE reflects a longstanding interpretation of the Act by the courts and the Department. The right of an individual child with a disability to receive ESY services is based on that child’s entitlement to FAPE under section 612(a)(1) of the Act. Some children with disabilities may not receive FAPE unless they receive necessary services during times when other children, both disabled and nondisabled, normally would not be served. We believe it is important to retain the provisions in Sec. 300.106 because it is necessary that public agencies understand their obligation to ensure that children with disabilities who require ESY services in order to receive FAPE have the necessary services available to them, and that individualized determinations about each disabled child’s need for ESY services are made through the IEP process. Typically, ESY services are provided during the summer months. However, there is nothing in Sec. 300.106 that would limit a public agency from providing ESY services to a child with a disability during times other than the summer, such as before and after regular school hours or during school vacations, if the IEP Team determines that the child requires ESY services during those time periods in order to receive FAPE. The regulations give the IEP Team the flexibility to determine when ESY services are appropriate, depending on the circumstances of the individual child. States may use recoupment and retention as their sole criteria but they are not limited to these standards and have considerable flexibility in determining eligibility for ESY services and establishing State standards for making ESY determinations. However, whatever standard a State uses must be consistent with the individually-oriented requirements of the Act and may not limit eligibility for ESY services to children with a particular disability category or be applied in a manner that denies children with disabilities who require ESY services in order to receive FAPE access to necessary ESY services.